Steve McQueen: the most iconic biker of all time. And favorite biker of all time. NEW! 2nd Annual Steve McQueen Days in Slater, Missouri on March 28-29! Read the PRESS RELEASE. Two new McQueen books available for pre-order! Another McQueen motorcycle up for auction. Cool McQueen items from Amazon! 2008 Bullitt Mustang. More HERE. Trailer for "Finding McQueen" available HERE. McQueen motorcycle SOLD. His Mini Cooper S and Ferrari that were FOR SALE. Ferrari SOLD. His Mercedes SOLD. My interview with Barbara McQueen. Details on the salute in Le Mans. McQueen's first wife updated version of My Husband, My Friend." It is also optioned to be made into a movie. Find out what type of shoes McQueen wore in The Great Escape, and off-screen, HERE. 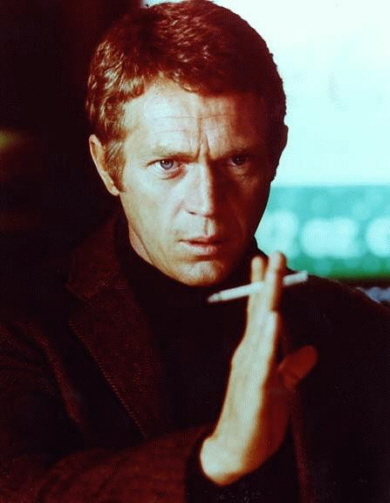 Order "The Essential Steve McQueen Collection" HERE. Never before published photos of Steve McQueen in 1979. Info on the dune buggy from The Thomas Crown Affair. Top 25 countries that have visited this site. See the LIST. Site went online 3/97, becoming the first McQueen website on the Internet. If you have any information, comments, or photos which could help this site, please write me at stvmcqueen@yahoo.com. Copyright 1997-2008 by Chris Lambos.